Thriveni Earthmovers receives the FIMI Award for Environment. Thriveni Earthmovers has always been committed to minimise the impact of our operations in the environment and to make contributions that matters.It gives us to get recognised for our Efforts. 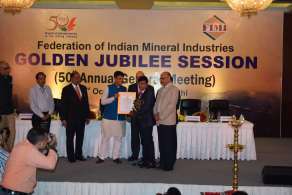 We are proud to announce that Thriveni Earthmovers has received the FIMI Award for Enivornment, from Mr.Piyush Goyal, the Hon’ble Minister of State for Power, Coal, New and Renewable Energy and Mines. An ISO 9001:2015, ISO 14001:2009 & BS OHSAS - 18001 accredited organisation.